Universe AV Club gives text and anything with alpha information the retro look of an old commercial or poorly-keyed footage. 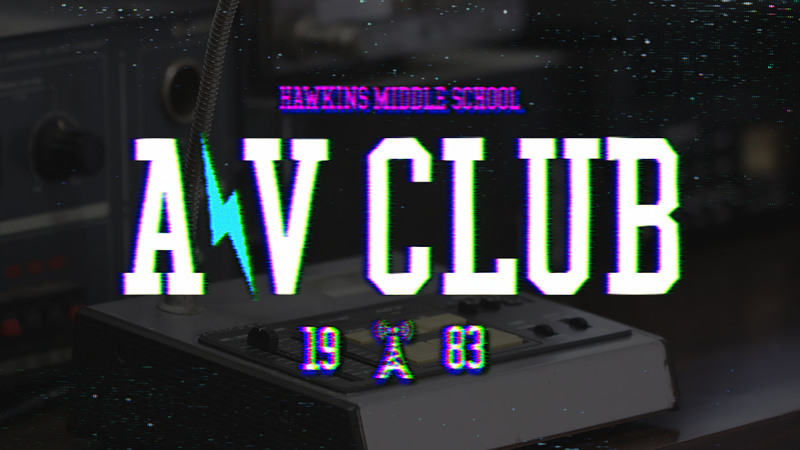 In Premiere, After Effects, Final Cut Pro X, Motion, Sony Vegas Pro, Hit Film, and Avid Media Composer, drag the AV Club effect onto your clip. Option 1: With your Corrector node selected, key out the black background from your text, and click Invert to flip the key around. To see the difference between these two options, read more here. Source Fuzzy creates and controls a feathered blur around the edges of your source. Source Block controls how artifacted or ‘blocky’ you want your source to look. Tint controls the tint of the effect during its flickering (if you don’t see this affect your output, try scrubbing your timeline or adjusting the Blink Speed and Color Blink parameters below). Tint Strength adjusts how heavily you want the tint to overlay onto the source. Edge Freakout controls how damaged and blurry the edges of the effect are. Edge Color adjusts the color of the edges of your source. Edge Hue Noise adds a noise pattern over the edge’s color. Edge Luma Noise adds a noise pattern over the edge’s luma channel. Quantize Color will reduce the amount of colors within your source; if you have a gradient, for example, the amount of shades within that gradient will be reduced on a scale from 0 (full reduction) to 100 (no reduction). Sharpen sharpens the contrast between the effect and the details of its edges. Separation offsets the source from the effect’s edges. Post Noise adds noise over the effect and its source. Jitter adjusts how much the source irregularly moves around. Enable creates a drop shadow locked at a 45 degree angle. Wiggle sporadically animates the shadow back and forth along the X axis . Offset adjusts the distance of the shadow from the source. Color affects the color of the shadow using a color swatch as a reference. Blink Speed adjusts how frequently your source and effect blink in and out of existence. Color Blink is an optional toggle which blinks only the color on and off. Blend Original adjusts the opacity of the source over the effect. Turning this to its highest setting essentially puts the effect entirely behind the source.